Windows are an important element of a well-ventilated home. Open windows keep the interiors cool and fresh in summer by allowing the breeze to flow throughout the home. However, windows are also a major causative factor when it comes to accidents involving children. Open windows are a major safety risk for families with young children. Strataville data reveals that around 50 children fall from windows or balconies each year in Australia. At least 80% of the children admitted to The Children’s Hospital at Westmead as a result of falling from a window had suffered significant or severe injuries – the majority of these children were aged under five. How do children fall out of windows? Fall incidents happen when children playing near an open window push themselves against the window pane, forcing it open. Children often climb up on top of furniture placed near an open window, leading to a fall. The Children’s Hospital at Westmead found that 50% of injuries related to children falling from windows, involved furniture near a window. Recognising the risks around windows in Australian homes, several measures have been put in place to minimise the occurrence of these fall incidents. Effective from May 2013, the National Construction Code (NCC) states that ‘any openable bedroom windows in new residential buildings, with a fall of two metres or more to the surface below, require protection to prevent children falling through them’. The protection itself is required to be fitted to ensure that a 12.5cm sphere (approximate size of a child’s head) cannot pass through and should withstand a force of up to 250 Newton/ 25kg. The increase in the number of people embracing apartment living has seen a corresponding rise in the number of window falls; however, legislation is being introduced to address the risk. In May 2018, The Strata Schemes Management Regulation 2016 (NSW) stated that all strata buildings in NSW must be fitted with devices that enable their windows to be locked at 12.5cm when in use. 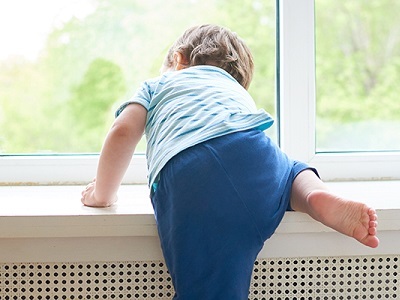 If you have young children and live in an older home, it’s worth taking extra precautions to ensure your windows don’t pose a risk to their safety. Do not rely on flyscreens to prevent young children from falling out of a window. An alternative to locks is to install security screens, which allow you to use the window properly with no possibility of a fall. Window screens from Crimsafe Security Systems can be customised to any style or size of window, giving you the bonus of security against intruders without compromising on design or ventilation. Have a look at our full range of window applications here.